Do your kids like having certain shirts because they have their favorite characters? 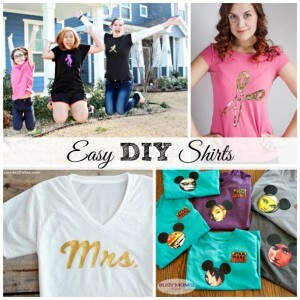 Now you can whip up a bunch of shirts just for them with the EXACT look they want – just pick a tutorial from this list of Easy DIY Shirts! We’ve made several of our own shirts over the past year – from Star Wars Rebels for our Disneyland trip, to Big Hero 6 characters and even some Frozen fun! Yes, I even put together some Transformers and Minion shirts for the kiddos before our exciting Universal Studios trip with Family Forward! They’re super easy, they get to PICK what they want, and if you’re able to nab the basic shirts on clearance you can save a LOT of money. I never thought of bleaching out your favorite shapes – and the fact that they chose Mickey makes me love the idea even more! The sky really is the limit with this one! Oh my gosh, I’m totally crushing on adding lace to a plain t-shirt to really glam it up and show your style! Again, glitter = awesome! What saying would YOU choose?